ASU celebrates Frankenstein's 200th birthday with writing dare. The tale of Frankenstein combines entertainment with serious ethical inquiry. Born of a nightmare, the story of Frankenstein is one of the most enduring cautionary tales regarding scientific creation and moral responsibility. As the story goes, a young Shelley conceived of the idea after a group of fellow writers dared each other to write the best scary story during the inclement summerThe year 1816 is known as the Year Without a Summer as the world was locked in a cold, volcanic winter caused by the eruption of Mount Tambora in 1815. In 1816, when Mary Shelley and Percy Bysshe Shelley (her soon-to-be husband) visited Lord Byron at Lake Geneva in Switzerland, the weather did not allow for outdoor activities, so the group spent time reading each other ghost stories indoors. of 1816 on the shores of Lake Geneva. Now, Arizona State University, National Novel Writing Month (NaNoWriMo), Chabot Space and Science Center, and Creative Nonfiction magazine are daring amateur and professional writers to do the same. The Frankenstein Bicentennial Dare competition hopes to inspire new stories that reflect on questions of science, technology, ethics, creativity and responsibility. The competition is part of the larger Frankenstein Bicentennial Project, launched by co-directors David GustonDavid Guston is the founding director of the School for the Future of Innovation in Society and co-director of the Consortium for Science, Policy and Outcomes. and Ed FinnEd Finn is the founding director of ASU's Center for Science and the Imagination. He is also an assistant professor with a joint appointment in the School of Arts, Media and Engineering (Herberger Institute for Design and the Arts/Ira A. Fulton Schools of Engineering) and the Department of English (College of Liberal Arts and Sciences). in 2013 to position ASU as a hub for the seminal novel’s global bicentennial celebration. “From the very beginning [‘Frankenstein’] found a happy home onstage and, later, on celluloid, television and video — not to mention breakfast cereal, Halloween costumes, political cartoons and more,” said Guston. “The novel itself grapples with issues — already apparent to Mary at the cusp of our scientific age but appearing again in each generation of knowledge-based technology, from galvanism forward to synthetic biology and artificial intelligence — related to the nature of creativity and responsibility. The Frankenstein Bicentennial Dare will be separated into two categories. The first, presented by ASU, NaNoWriMo and Chabot, invites participants to write short, scary tales about unexpected consequences and unintended monstrosities — though monsters are not always evil, and things that begin innocently enough, like a song, can be misappropriated and wrought into something monstrous. Winners of the short-fiction contest will receive personal feedback from Hugo and Sturgeon Award-winning science fiction and fantasy author Elizabeth Bear, as well as a curated selection of classic and contemporary science fiction books. Submissions will be accepted through July 31. The second, a long-form nonfiction competition presented by ASU and Creative Nonfiction magazine, asks authors to document true stories about the evolving relationships between humanity and technology for a chance to win a $10,000 grand prize or one of two $2,500 runner-up prizes. Winners will be announced in mid-2017, and winning essays will be included in an upcoming issue of the magazine. Submissions will be accepted through March 20, 2017. Center for Science and the Imagination editor and program manager Joey Eschrich hopes the wide reach of ASU and the various partners involved will ensure the greatest amount of public engagement possible. Science advancements and writing have a long history together. Submissions for the Frankenstein Bicentennial Dare are being accepted now. Full details, contest rules and guidelines for entries can be found at frankenstein.asu.edu/dare. 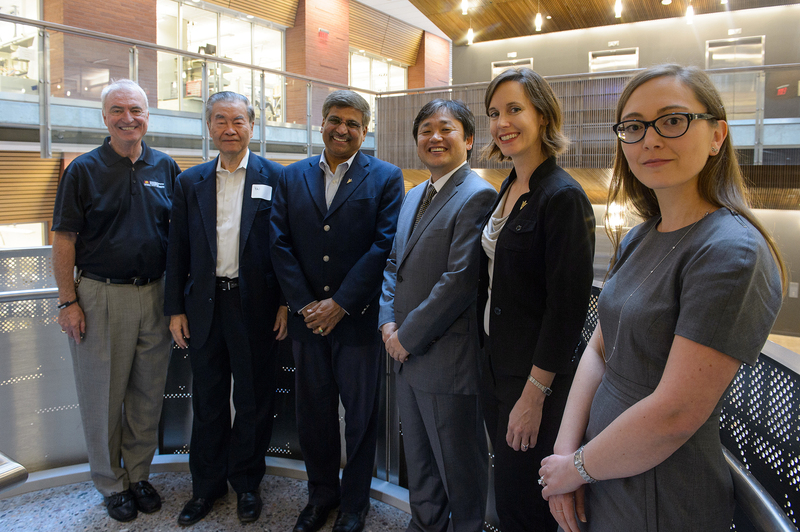 Arizona State University’s Center for Cybersecurity and Digital Forensics (CDF) is partnering with Allstate Insurance to address digital security challenges by advancing cybersecurity research, education and entrepreneurship. The partnership is expected to be the first of many that will link the center to industry, university and government entities that will play a vital role in producing a skillful workforce in the area of national security and contribute to economic growth. To extend the impact of ASU cybersecurity and digital forensics research even further, CDF also aims to promote commercialization and technology transfer activities to advance innovation and entrepreneurial activities in the field. “This partnership fits perfectly with the center's mission, bringing together expertise from private industry and academia, and giving students an opportunity to get hands-on experience. I look forward to working with Allstate to continue to establish the Valley as a leader in cybersecurity research, entrepreneurship and education,” said Nadya Bliss, director of the Global Security Initiative that houses CDF. The Center for Cybersecurity and Digital Forensics focuses on three pillars — education, research and innovation — to help produce an outstanding workforce in the area of national security. It tackles short-term and long-term security challenges via top-notch research expertise and activities; and significantly contributes to economic growth in Arizona and the U.S. by transferring innovative and patented technologies to the marketplace. Learn more about ASU’s Global Security Initiative and the Center for Cybersecurity and Digital Forensics at globalsecurity.asu.edu. For further information, contact Gail-Joon Ahn, director, Center for Cybersecurity and Digital Forensics. The Allstate Corporation is the nation’s largest publicly held personal lines insurer, protecting approximately 16 million households from life’s uncertainties through auto, home, life and other insurance offered through its Allstate, Esurance, Encompass and Answer Financial brand names.